The World’s Greenest Buildings tackles an audacious task. Among the thousands of green buildings out there, which are the best, and how do we know? 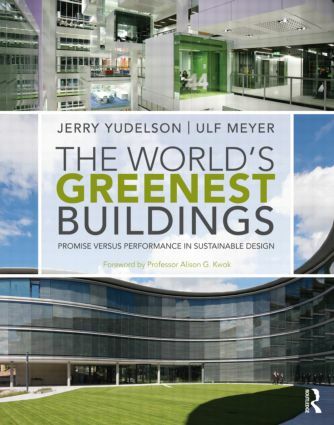 Authors Jerry Yudelson and Ulf Meyer examined hundreds of the highest-rated large green buildings from around the world and asked their owners to supply one simple thing: actual performance data, to demonstrate their claims to sustainable operations. This guide uncovers some of the pitfalls that lie ahead for sustainable design, and points the way toward much faster progress in the decade ahead. Sustainable Cities: (How) Can Sustainable Urban Development Be Quantiﬁed?